Enthronement of a new , better and prosperous Nigeria may not be achieved without recourse to the dynamics represented by late Dim Chukwuemeka Odumegwu Ojukwu. This was the centre of discourse at the Maiden edition of Dim Odumegwu Ojukwu. Memorial Annual Lecture at the Chukwuemeka Odumegwu Ojukwu University, Igbariam Campus. 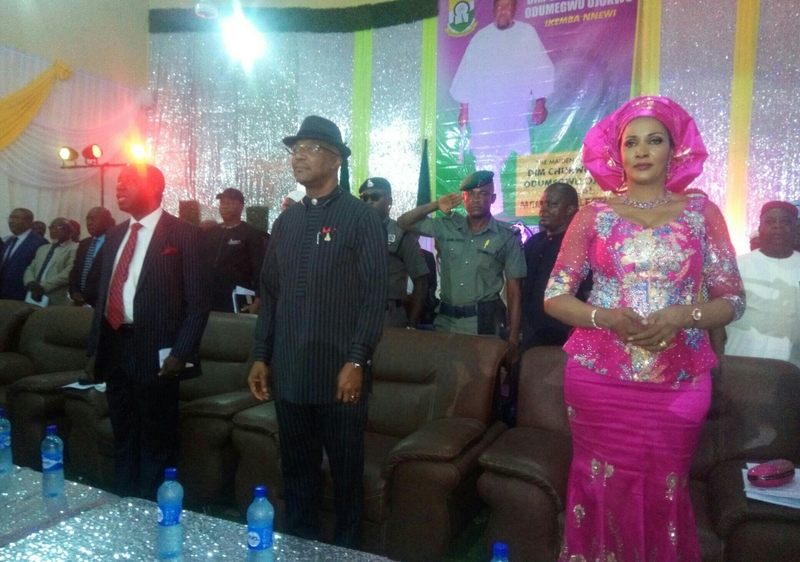 The event was attended by Governor Willie Obiano, Ambassador Bianca Ojukwu, Traditional Rulers, government functionaries, Professors, academia, the clergy and legal luminaries, among others who converged at the Chief Ben Nwazojie S.A.N Law Auditorium of the Institution, the venue of the event. Governor Willie Obiano, who was represented by his Deputy, Dr Nkem Okeke, proposed a rallying point for Ndi Igbo to project their voice through political awareness, adding that Ndi Igbo have great minds and entrepreneurs to achieve whatever they will. The Guest lecturer Professor Chidi Odinkalu, who highlighted the Nigeria’s historical perspective, lamented that while many people knew the name Ojukwu as being synonymous with Civil war, very few knew his other sides that laid the foundation for a United Nigeria, which is why he advocated the need for sustenance of the lecture series to drum home his good legacies. Professor Odinkalu who spoke on the topic “Between Force of Reason and Reason For Force: Legacy of Chukwuemeka Odumegwu Ojukwu” centred the discussion on Ojukwu’s patriotism, politics of state creation and existence, Political and military stratification, Regional integration self determination and Humanitarianism, stressing that the reason and controversies surrounding the war, have not really gone away. While pointing out that Anambra is the heart of Nigeria’s civilization, Professor Odinkalu sought to correct the erroneous conception concerning the war, saying that late Ojukwu truly fought for citizenship and dignity, calling on Ohaneze Ndi Igbo and stakeholders to have it at the back of their mind when arguing for true federation. Earlier, the Chairman on the Occasion, Professor Chukwuma Soludo noted that Nigeria remains a work in progress which can be properly understood and worked on, with adequate reflection of Dim Ojukwu’s sacrifices and contributions to the Country. Ambassador Bianca Ojukwu, while appreciating State government and the University management for instituting the Lecture series noted that APGA is one of the legacies of her late husband, as such should not be allowed to wane. Late Chukwuemeka Odumegwu Ojukwu hails from Nnewi. He was born on November third 1933, and died on twenty sixth November 2011. Plaques presentation and cutting of cake featured at the event.